The rhino and elephant horn poaching has got so out of hand, that even museum ivory is being targeted. Witness the recent attempt to escpae with the chainsawed tusk of an elephant once owned by Louis XIV, and on display at Paris’ Natural History Museum. 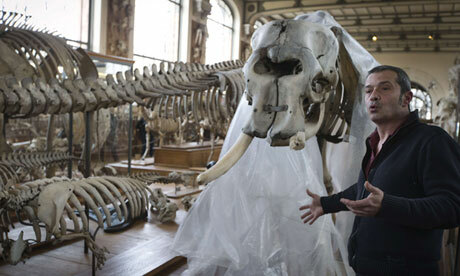 Visitors to Paris’s popular Museum of Natural History this weekend found a key exhibit under wraps after a man broke in and chainsawed a tusk from an elephant which once belonged to the Sun King, Louis XIV. Police were called to the museum in the early hours of Saturday morning where they found a chainsaw still whirring after a man in his 20s escaped over a wall with a tusk over his shoulder. A police official said a neighbour of the museum on Paris’s Left Bank alerted authorities after hearing a strange sawing sound at around 3am. The museum alarm system was activated and startled the intruder into fleeing just minutes after beginning his chainsaw attack. He was treated in hospital for a fractured ankle from a fall while escaping and was being questioned by investigators. Better keep an eye on your pianos. The only thing that has a hope of stopping this is a strictly enforced Chinese government ban on any and all ivory. But is any government, including the US, pressing this? Desperate and dangerous. The manner in which the theft was carried out begs the question – was no-one concerned or even alerted when someone walked into the museum with a chainsaw under his arm? I recently saw a new car being showcased in China. Maroon coloured exterior with ivory trim. Not ivory coloured interior, no it was decorated on the outside with carved ivory. The nouveau riche of China are demanding more bang for their buck and they’re getting it in spades and the governments of the world don’t give a fig. It’s all about the mighty dollar, or yuan or baht.